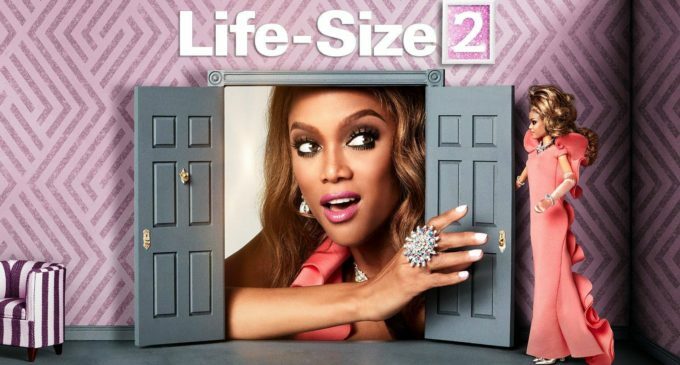 Tyra Banks and friends hit the big screens again with”Life Size 2,” which premiered on Dec. 2 via Freeform. While the film wasn’t what I expected (or wanted), I enjoyed the movie for what it was: a nostalgic experience. The beginning was unrecognizable from the original, though. We see Grace (played by Francia Raisa) and her partying ways, but going into the movie I thought Grace was going to be a hardworking CEO full of stress and who needed advice. Instead she was a young socialite, and it turns out she was given this job by her mom (who’s in jail, mind you), making the character look spoiled. Another surprise was the revelation that the main character herself had taken part in casting the spell, so when Eve (played by Banks) comes to life, she should’ve expected it. There’s an awkward and funny exchange, between Eve and Grace where Grace thinks she slept with her. She doesn’t believe the spell worked and thinks Eve is a stranger. However, there are some similarities between the original and new sequel. Eve’s character and personality stays the same: She’s naive and just wants to help her best friend. Her naivety is emphasized by the people around her who notice she’s very odd. She ate a stick of butter and keeps referring to herself as a doll. This Eve though, unlike the original, has a working phone and credit card. We get a few references to the original, and they even mention Kaycee by name. Eve, though played by the original actress is still a different Eve so there’s a lot she doesn’t know about the world like her clothes are out of fashion. We get a shopping montage where Eve tries on all these clothes, while I enjoyed the scene, the scene was almost too reminiscent of the original — some of the dialogue was a near carbon-copy to the first flick. Eve is used to having things done for her so she didn’t know people dress themselves, which was a nice nod to the original. This movie centered around Christmas, as we see with the festivities at the end, and this changed the tone of the movie because the overall message felt more heartwarming. It was the holiday season after all. The fact that we see the perspective of an adult if their doll came to life was a nice addition to the familiar story. Eve is supposed to change things for the better, and the main character is supposed to have character growth, but in the sequel we also get dual perspectives of the adults and kids. With all that being said, I wouldn’t go out of my way to watch this movie. Similar to the “Mean Girls” sequel, I am glad I watched it, even though it was awkward at moments and predictable. ‘Justice League’ needs some improvement but is a step in the right direction.